Deuteronomy 16:13-15 says, "Thou shalt observe the FEAST of TABERNACLES seven days AFTER thou hast GATHERED IN thy corn (grain) and thy wine. And thou shalt REJOICE in thy feast, thou, and thy son, and thy daughter, and thy manservant, and thy maidservant, and the Levite (minister or rabbi), the stranger (newcomer), and the fatherless (orphan), and the widow who are within thy gates. SEVEN DAYS shalt thou keep a SOLEMN FEAST (or "DANCE") unto the Eternal thy God in the place which the Eternal shall choose; because the Eternal thy God shall BLESS THEE in all thine INCREASE, and in all the works of thine hands; therefore thou shalt surely REJOICE." Jews believe that God will make the coming year as happy as we make the Sukkah celebration (Tanhuma Bereshit). "The FIFTEENTH DAY of this SEVENTH MONTH shall be the FEAST OF TABERNACLES for SEVEN DAYS unto the Eternal. On the first day shall be an HOLY CONVOCATION ("rehearsal" -- #4744): ye shall do NO SERVILE WORK therein.... Also in the FIFTEENTH DAY of the SEVENTH MONTH, when ye have GATHERED IN the fruit of the land, ye shall keep a feast unto the Eternal SEVEN DAYS.... And ye shall take on the FIRST DAY the BOUGHS (or "FRUIT" interpreted as CITRON) of GOODLY TREES, BRANCHES of PALM TREES, and the BOUGHS of THICK (thickly leaved) TREES (traditionally interpreted as MYRTLE branches), and WILLOWS of the BROOK; and ye shall REJOICE before the Eternal your God SEVEN DAYS. And ye shall keep it a feast unto the Eternal SEVEN DAYS in the year. It shall be a statute FOREVER in your generations: ye shall celebrate it in the SEVENTH MONTH. Ye shall DWELL in BOOTHS SEVEN DAYS; all that are Israelites born shall DWELL in BOOTHS; That your generations may know that I made the children of Israel to DWELL in BOOTHS, when I brought them out of the land of Egypt" (Lev.23:33-43). Eat, sleep, pray and study in the booth. The Hebrew SUKKOT ("booths") is translated "TABERNACULA" in the Latin Vulgate. This is where we get the name "Feast of TABERNACLES." It is remarkable that Moses called a meeting ofthe children of Israel to explain the need for building materials for the construction of God's TABERNACLE which coincided with the Feast of TABERNACLES that year in Exodus 35. But a better translation would be Feast of SUKKOT. Use tents only when it rains or at night (cp. Hos. 12:9). They don't substitute for a booth. The shade in the sukkah should be greater than the sunlight. But if a heavy rain can't penetrate the roof of a sukkah, the sukkah is not valid (Mishnah Sukkah 1:2). 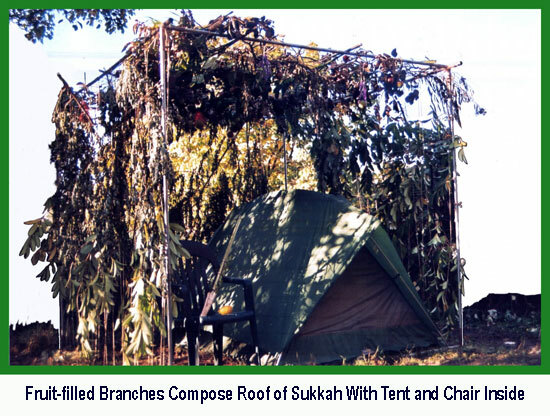 Should We Build A Sukkah Out of Branches? Notice in Genesis 33:17 that "Jacob ... made booths for his cattle." In Leviticus 23:40, BRANCHES are mentioned. But we are not told what to use them for. In Nehemiah 8:14-15 we are told to USE those BRANCHES "to MAKE BOOTHS, as it is written." "And ye shall take on the first day the BOUGHS of GOODLY TREES, BRANCHES of PALM TREES, and the BOUGHS of THICK (thickly leaved) TREES, and WILLOWS of the brook; and ye shall REJOICE before the Eternal ... Ye shall DWELL IN BOOTHS seven days" (Lev.23:40,42). "OLIVE BRANCHES, and PINE BRANCHES, and MYRTLE BRANCHES, and PALM BRANCHES, and BRANCHES of THICK (thickly leaved) trees" (Neh.8:15). Weave the branches together. The Hebrew word "SUKKAH" originally meant "WOVEN." Temporary shelters were woven together from branches and leaves to protect livestock (Gen. 33:17), to provide resting places for warriors during battle (2 Sam. 11:11), to shelter watchers in the vineyard (Isa. 1:8), and to protect the people from the incessant heat ... During harvest time, Israelite fields were dotted with such booths, woven hastily together as temporary homes for the harvesters" (p. 157, The Fall Feasts of Israel, Glaser). "And there shall be a tabernacle (or HUT; Heb. "SUKKAH") for a shadow in the daytime from the heat, and for a place of refuge and for a covert from storm and from rain" (Isa.4:6; cp. Hos. 14:7). An alternate translation of Leviticus 23:40 says "take the product (fruit) of hadar (beautiful) trees." Or "take a beautiful fruit" -- "pri ets hadar" -- meaning "unblemished." This means not dried up, spotted, punctured, small or broken-stemmed. Suspend from the SUKKAH'S roof FIGS, POMEGRANATES, OLIVES (Deut. 8:8), APPLES, ORANGES, CHERRIES, GRAPES and CITRONS. Don't use honey, wheat or barley which are not from trees. 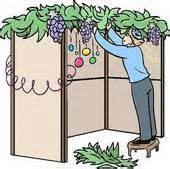 Decorate the SUKKAH and make it beautiful (Sukkah 28b). If one is ill or if it rains, he is exempt from dwelling in the Sukkah (26a). Otherwise sleep and eat in the SUKKAH for seven days. When you enter the SUKKAH each day, say: "Blessed are You, O Lord, King of the Universe, Who has sanctified us by His commandments, and commanded us to dwell in the Sukkah." Affix a mezuza to the entrance. It is okay to use a framework made of PVC PIPE or METAL CONDUIT to ensure the safety and stability of the building. Also CANVAS or NYLON sheeting can be used to make walls. But BRANCHES are preferable. 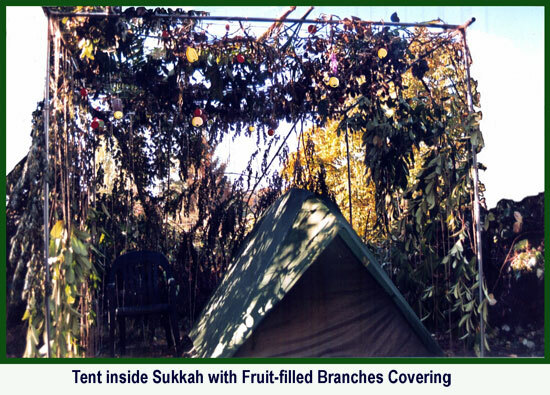 A TENT inside the SUKKAH is permitted as long as it is only for sleeping and when it rains (cp. Hos. 12:9; Hebrew "ohel" can mean "tent" or "covering."). But the roof MUST be made of BRANCHES. Teepees and lean-toos don't have a roof so don't qualify. Should We Wave A Palm Branch and Citron? But what about WAVING the FOUR SPECIES? Israel waved barley in the spring (Lev. 23:11). Two loaves of wheat were waved in the summer (Lev. 23:20). Why not wave the ETROG and LULAV in the fall? Josephus said "the law enjoins us" to wave the LULAV and CITRON (Ant. 3:10:4 & 13:13:5). The Mishnah Sukkah 3:4 says, "THREE MYRTLE branches [are needful] and TWO WILLOW branches and ONE PALM branch and ONE CITRON" and it should "be carried seven days" (Sukkah 3:12). "Willows" plural (aravot) (Lev. 23:40) are taken to mean two in the left pocket. Three words (anaf, aytz, and avot) in the expression "the thick bow of a tree" are defined as three myrtle branches in the right pocket. The date palm's solid, uncleft spine should face you in the center. The myrtles are superior to the willows and so are placed higher in the holder. "A great multitude ... stood before the throne, and before the Lamb, clothed with white robes, and PALMS in their HANDS" (Rev.7:9). 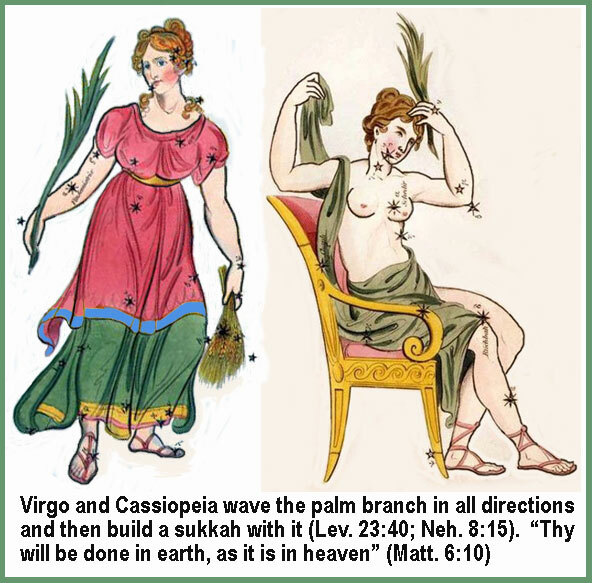 Each day of Sukkot (except Saturday), a blessing is recited while holding the FOUR SPECIES together with the CITRON pointing down (before conversion we were upside down). Then the CITRON is turned over with the tip pointed upward and they are shaken together in six directions -- three times in each direction. First say, "Blessed are you, Lord our God, King of the Universe, Who has sanctified us with your commandments and has commanded us concerning the taking of a PALM branch." On the first day , after the preceding blessing, say: "Blessed are you, Lord our God, King of the universe, who have kept us alive, sustained us, and brought us to this season." Then, on all days except the Sabbath, face east. Take the WILLOW, PALM, and MYRTLE in your right hand and the ETROG (stem pointing up) in your left hand. Shake and wave first to the south three times (right), then to the north three times (left), third to the east three times (forward), fourth upward three times, fifth downward three times, sixth to the west three times (rear) being careful to never invert the palm frond which has its spine always facing toward you. This is done "to demonstrate God's Omni-presence" (Sukkah 37b). Say: "Save now, I beseech thee, O Eternal! O Eternal, I beseech thee, send now prosperity. Blessed is he that cometh in the name of the Eternal" (Ps. 118:25-26). This custom is based on Matthew 21:8-9, 15, John 12:12, Rev. 7:9 and Sukkah 4:2-7. Then read Psalm 113 to 118, called the Hallel, just as Jews do on each day of Sukkot. At the Temple each day of the feast the priests and people encircled the altar once waving their LULAVS and reciting Psalm 118:25. On the seventh day they decorated the altar with WILLOW branches and circled it seven times instead of just once. The cry "Save now" was repeated seven times. This was to remind them of Jericho. Today we can parade around our SUKKAHS following their example, "and all the trees of the field shall CLAP their HANDS" (Isa. 55:12) -- a prophecy fulfilled every time we shake the branches together. "With BOUGHS in HAND, join in the festal procession" (Ps. 118:27), NIV). Then on the seventh day they would BEAT the WILLOW BRANCHES on the ground to show the destruction of those people who had neither good deeds nor knowledge of Torah. "Thou shouldest have SMITTEN five or six times" (2 Ki. 13:14-19) since God may SMITE your enemies the same amount in the coming year. The only way the other branches or people are saved is by together supplying what each alone lacks. It is customary to shake the LULAV when reciting Psalm 118:25 which begin with "SAVE US." Also "many people that were come to the feast, when they heard that Jesus was coming to Jerusalem, TOOK BRANCHES of PALM TREES, and went forth to meet him" (John 12:12-13) "and SPREAD THEM in the way" (Matt.21:8). Each type of TREE BRANCH represents a type of ISRAELITE (Isa.61:3; John 15:2). The WILLOW has neither fruit nor aroma. It represents those people who have no knowledge of the Torah, nor do they perform good deeds. The MYRTLE has pleasant aroma but no fruit. It represents those people who perform good deeds but do not have a knowledge of the Torah. The PALM has good fruit but no aroma. It represents those people who have knowledge of the Torah but do not perform good deeds (Ps. 92:12). The CITRON has both good fruit and good aroma. It represents those people who have a thorough knowledge of the Torah and perform good deeds for others. It is held next to the heart alone but some won't be saved unless they stay TOGETHER with the other branches (Yalkut 188a; Menahot 27a). That is why they are all WAVED TOGETHER. The scribes and Pharisees taught the SUKKAH and LULAV. Jesus said, "The scribes and Pharisees sit in Moses' seat: All therefore whatsoever they bid you observe, that OBSERVE and DO; but do not ye after their works; for they say, and do not" (Matt. 23:2-3). To the Jews "were committed the ORACLES of God" (Rom. 3:4) and Paul was "BLAMELESS" in regard to these laws of the Pharisees (Phil 3:6). Paul "committed nothing against the ... CUSTOMS of our fathers" (Acts 28:17) so he must have built a SUKKAH and waved the LULAV. Yes, "It shall be a statute FOREVER in your generations" (Lev. 23:41). Zechariah 14:16 says, "it shall come to pass that everyone that is left of all the nations which came against Jerusalem (in the Millenium) shall even go up from year to year to worship the King, the Lord of hosts, and to keep the FEAST OF TABERNACLES." God has a SUKKAH also. "For in the time of trouble he shall hide me in his PAVILION ( or HUT; Heb. SUKKAH); in the secret of his TABERNACLE (Heb. "ohel") shall he hide me" (Ps.27:5; cp. Ps.31:20). "In Salem (Jerusalem) also is his tabernacle (HUT; Heb. "SOCH") and his dwelling place in Zion" (Ps.76:2). The FEAST of SUKKOT in the SEVENTH MONTH may actually be picturing GOD dwelling in HUMANS in the MILLENIUM which is the SEVENTH 1000-YEAR period of human history. Both Peter and Paul compare the SUKKAH (Greek "skenoma") to a HUMAN BODY (2 Pet. 1:14; 2 Cor. 5:1,4) and each human "is the TEMPLE of the HOLY SPIRIT" (1 Cor.6:19). Just as CHRIST INCARNATED HIMSELF in a HUMAN BODY and "TABERNACLED" (Greek "scenoo") among us (John 1:14; 2:19) and DWELLS IN Jewish Christians NOW (1 Cor. 6:19), the time may come in the Millenium when GOD might DWELL IN ALL HUMANS for their 70-YEAR lifespan (Ps. 90:10) just as Jewish Christians DWELL IN SUKKAHS now for SEVEN DAYS. Perhaps even immortal saints may dwell in humans in the Millenium. "God hath said, I will DWELL in THEM, and WALK in THEM; and I will be their God, and they shall be my people" (2 Cor. 6:16-17; Ez. 37:26-27). "The voice of rejoicing and salvation is in the tabernacles of the righteous (Ps. 118:15). "Behold, the TABERNACLE (Gr. 4633 "skene") of God is with men, and he will dwell with them" (Rev. 21:3). In microcosm, when we DWELL IN BOOTHS each year for seven days, we may determine the WAY GOD will DWELL in US that coming year. RAIN was necessary in the often dry land of Palestine. Therefore the Israelites asked God for RAIN using the ceremony of the DRAWING OF WATER from the Pool of Siloam and bringing it back through the WATER Gate (hence the name) to the temple and POURING it on the altar (Sukkah 4:9) and then pouring WINE on the altar. The ceremony was performed only during Sukkot, on every day except the first day and the Sabbath. After POURING the WATER, priests would lead the people in a march around the altar singing Psalm 118:1,25,29. Psalms 120 to 134 were sung by the Levites as they ascended the fifteen steps of the temple and performed this ceremony. The people also sang "With joy we will draw water out of the well of salvation" (Yeshua) (Isa. 12:3; M. Sukkot 5:1). Without an altar today, we merely recite Zechariah 10:1 as follows: "O Eternal send us RAIN in the time of the latter RAIN" (in the sense of prosperity and more Holy Spirit as well as literal RAIN). This is based on 1 Samual 7:6 and Zechariah 14;16-18 as well as Zechariah 10:1. Zechariah explicitly mentions "the BOWLS before the altar" (14:20) and "NO RAIN" for those who don't celebrate this feast (14:17) showing that this "WATER-POURING" ceremony was not just a human tradition. In fact, if there truly is such a thing as a "RAIN DANCE," it is the CIRCLE-DANCING at the Feast of Sukkot while waving the LULAV. "Ask of the Eternal RAIN in the time of the LATTER RAIN" (Zech. 10:1). We believe it would be shameful to pour WATER and WINE on the GROUND today since the worshippers rioted when the High Priest Alexander Jannaeus did this in 95 B.C. (Ant. 13:13:5). Therefore we DON'T POUR WATER or WINE at all. When a soldier pierced Jesus' side, out poured WATER and BLOOD (John 19:34) fulfilling this ceremony. Yeshua said he was the LIVING WATER being poured out during this ceremony (John 7:2; 37-38). Priests also built a sukkah over the altar typifying Jesus' sacrifice covering our sins. Anciently the priest returned from the Pool of Siloam with his golden pitcher filled with WATER, and POURED it into one of two silver bowls on the altar for the last time as an appeal to God for RAIN during the coming year. Then the "Hallel" (Ps.113 to 118) was sung to the sound of the flute, (The flute player was called "pierced one") the people responding and worshipping as the priests blew their silver trumpets three times, and the worshippers waved leafy branches toward the altar while the last words of Psalm 118 were chanted. Then CHRIST SHOUTED John 7:37-38 (Edersheim's The Temple, p.281). "Now on the last day, the great day of the feast (Hoshanah Rabbah -- 7th day), Yeshua stood and cried out, saying, "If ANY MAN THIRST, let him come unto me, and DRINK. He that believeth on me, as the scripture hath said, out of his belly shall flow rivers of LIVING WATER (Heb. "mayim hayim" meaning RAIN or RIVER WATER, not well water. A certain prescribed amount of water in the ritual immersion bath had to be "LIVING WATER.") (But this spoke he of the SPIRIT, which they that believe on him should receive; for the HOLY GHOST (Spirit) was not yet given, because Jesus was not yet glorified.)" (John 7:37-39). The WATER-POURING ceremony commemorated the smiting of the rock in the wilderness. That rock was a symbol of Christ (1 Cor.10:4) whose death would cause living STREAMS of salvation to flow. From Christ's throne flows the RIVER of life (Rev.22:1). Revelation 22:17 says, "Let him who is thirsty come, let him who desires take the WATER of life without price." One name of the seventh month is "Ethanim" and means "EVER-FLOWING STREAMS" because this was the end of the dry season, just before the early RAINS, when all but the permanent RIVERS were dry. Ezekiel 47:1 describes a RIVER flowing from the rock under the temple. As Isaiah 55:1 says, "Ho, EVERY ONE that THIRSTETH, come to the WATERS, and he that hath no money; come, buy and eat." Obtain the HOLY SPIRIT! But how? "Seek ye the Eternal while he may be found, call ye upon him while he is near; Let the WICKED FORSAKE his WAY, and the UNRIGHTEOUS man his THOUGHTS, and let him RETURN unto the ETERNAL, and he will have mercy upon him; and to our God; for he will abundantly pardon. For my thoughts are not your thoughts, neither are your ways my ways, saith the Eternal.... For as the RAIN (Holy Spirit) cometh down, and the SNOW (Holy Spirit) from heaven, and returneth not thither, but WATERETH the earth, and maketh it bring forth and BUD (conversion), that it may give seed to the sower, and BREAD to the eater (FRUIT of RIGHTEOUSNESS), So shall my word be that goeth forth from my mouth; it shall not return unto me void, but it shall ... prosper in the thing whereto I send it" (Isa.55:6-11; cp. Ez.36:25-27). "For I will pour WATER (Holy Spirit) upon him that is THIRSTY (unconverted), and FLOODS (Holy Spirit) upon the DRY GROUND (unconverted); I will pour my SPIRIT upon thy seed, and my blessing upon thine offspring" (Isa.44:3). "In that day there shall be a FOUNTAIN opened to the house of David and to the inhabitants of Jerusalem for sin and for uncleanness" (Zech.13:1). As Psalm 42:1-2 says, "As the hart panteth after the WATER brooks, so panteth my soul after thee, O God. My soul THIRSTETH for God, for the living God; when shall I come and appear before God" (cp. Ps.63:1 & 143:6). And as Isaiah 12:2-3 says, "Behold, God is my salvation ... with joy shall ye draw WATER (Holy Spirit) out of the WELLS of salvation (Yeshua)." The Lord is "the fountain of LIVING WATERS" (Jer.17:12-13). And Christ said, "whosoever DRINKETH of the WATER that I shall give him shall never THIRST, but the WATER that I shall give him shall be in him a WELL of WATER springing up into everlasting life" (John 4:14). "I will give to him that is ATHIRST of the fountain of the WATER of LIFE freely" (Rev.21:6) "On that day LIVING WATERS shall flow out from Jerusalem" (Zech. 14:8). It is an established Jewish teaching that Abraham, Isaac, Jacob, Joseph, Moses, Aaron and David are represented by deserving POOR men invited as guests in the SUKKAH (cp. Matt. 25:35-40). The Messiah's wedding supper is the theme of Sukkot. "A certain king ... made a marriage for his son, And sent forth his servants to call them that were bidden to the wedding; and they would not come" (Matt. 22:1-3) to this "dinner" (v.4) just as many today are too busy to attend the Feast of Sukkot. But "many shall come from the east and west, and shall sit down with Abraham, and Isaac, and Jacob in the kingdom of heaven" (Matt. 8:11) which is pictured by our eating in Sukkahs as we're commanded. Jesus said, "When thou makest a FEAST, call the POOR, the maimed, the lame, the blind, And thou shalt be blessed" (Luke 14:13-14). Peter may have had this same custom in mind when he said, "Let us make here three TABERNACLES, one for You, and one for Moses, and one for Elijah" (Matt. 17:8). Unbelievers will attend a separate banquet where fowls will eat their flesh (Rev. 19:17-18). Just as the BARLEYwas READY to be HARVESTED at the time of the FEAST of UNLEAVENED BREAD and the WHEAT was HARVESTED at the time of the FEAST of FIRSTFRUITS (Pentecost), so also the FRUITS and NUTS of the vines and trees were HARVESTED at the time of the FEAST of INGATHERING (Sukkot). The Feast of Sukkot occurs "in the END of the (AGRICULTURAL) YEAR, when thou hast GATHERED IN thy labors out of the field" (Ex.23:16). Yes, the HARVEST represents the "end of the age" (Matt.13:39; Rev.14:15; Joel 3:13). The resurrection of Christ was the wave sheaf of BARLEY. The resurrection of Jewish Christians who live during the 6000 years will be the two wave loaves of WHEAT. The gleanings (Lev. 23:22) which are harvested last by the poor and alien may picture "deathbed repentances." They remain in the field (world) till the Millenium when they're harvested. 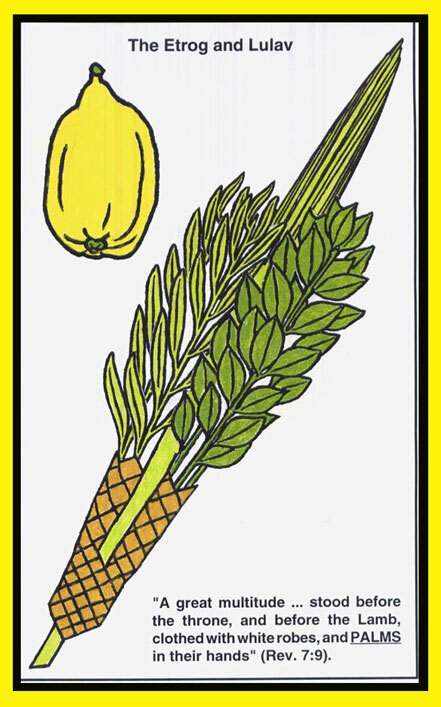 The resurrection of the rest of humanity -- Millenial Jewish Christians and beyond -- will be the waving of the lulav and etrog representing the FRUITS and NUTS. The first fruits grain harvest is pictured by a single DAY because it is the SMALL SPRING HARVEST after the "FORMER RAIN" (Joel 2:23; Hos.6:3; Deut.11:14; Jer.5:24; James 5:7) moderately watered the grain fields as a type of of the Holy Spirit. There are comparatively few people in the first resurrection. The LARGE FALL HARVEST gathering in the fruits and nuts is pictured by EIGHT DAYS because it is many children of God's family in the second resurrection to immortality. Both SPRING grain and FALL fruit harvests end on an EIGHTH DAY. The HARVEST of the wicked grapes will be "RIPE" just before the Millenium begins also (Rev.14:15). The abundant fall harvest pictures a literal increase in agricultural production during the Millenium (Lev.26:5; Amos 9:13) as well as a spiritual harvest at that time (Rom.11:26; Isa.2:3). Also, just as a farmer reaps what he has sown in the previous year physically at the time of the Feast of Ingathering, so also Jewish Christians will reap what they have sown in this life spiritually at the time of the Millenium -- a great reward if we plant many seeds. The abundant "LATTER RAIN" (Joel 2:23; James 5:7; Jer.3:2-3) pictures a literal increase during the Millenium even on desert regions (Isa.35:1,6,7; 51:3) as well as the work of the Holy Spirit converting millions then living in the Millenium (Isa.32:14,15; Isa.44:3; John 7:37-39; Acts 2:16-17). As Hosea 10:12 says, "Sow to yourselves in righteousness, reap in mercy, break up your fallow ground; for it is time to seek the Eternal, till he come and RAIN RIGHTEOUSNESS upon you." The Eternal shall come unto us as the RAIN, as the LATTER (second coming as king Messiah ben David to fulfill the fall feasts) and FORMER RAIN (first coming as suffering Messiah ben Joseph to fulfill the spring feasts) unto the earth" (Hos.6:3) -- "both AUTUMN and SPRING RAINS" (Deut.11:14). Both come in the first month (Joel 2:23) -- one in Tishri and one in Nisan. Grapes, olives, figs and pomegranates were gathered in (Ex.23:16) during the heavy "LATTER RAIN" (Joel 2:23,28,29; Isa.32:14-15; 44:3; John 7:37-39; Zech.10:1) of the FALL. As God's Holy Spirit pours out in abundance, the whole world will be saved (Joel 2:28-29). PRAYING FOR RAIN for next year's crops was an important part of the ritual of the Feast of Sukkot. The spring feasts picture Christ's first coming. The fall feasts picture his second coming. TODAY is "A DAY of salvation" (Isa.49:8). Paul quoted from this passage in 2 Corinthians 6:2 and so the word "THE" should be translated "A" in this passage too. The MILLENIUM and after is ANOTHER DAY of salvation and so "all Israel shall be saved" (Rom.11:26). And not just Israel, but "MANY PEOPLE (nations) shall go and say, Come ye, and let us go up to the mountain (kingdom --Jer.51:24-25) of the Eternal, to the house of the God of Jacob; and he will teach us of his ways" (Isa.2:3). God will pour out his Spirit upon "ALL FLESH" (Joel 2:28), and "compel" (order) non-Israelites to be converted (Luke 14:23). The LARGE FALL HARVEST "is the end of the age" (Matt. 13:39). Many people will be converted all through the Millenium. The salvation and RESURRECTION of ALL HUMANS after the Millenium will be the FRUITS and NUTS of the vines and trees. Converted people will live till a ripe old age and die. Then they will become immortal. God will destroy the "COVERING cast over ALL PEOPLE" of IGNORANCE and the "VEIL that is spread over ALL NATIONS" (Isa.25:7) of SUPERSTITION. "For the earth shall be filled with the knowledge of the glory of the Eternal, as the waters cover the sea" (Hab.2:14; Isa.11:9). "And they shall teach no more every man his neighbor, and every man his brother, saying, know the Eternal; for they shall all know me, from the least of them, unto the greatest of them, saith the Eternal; for I will forgive their iniquity, and I will remember their sin no more" (Jer.31:34; cp. Isa.26:9). "And in that day shall the DEAF (spiritually) HEAR the words of the book, and the eyes of the BLIND (spiritually) shall SEE out of obscurity, and out of darkness" (Isa.29:18). This is the GREAT FRUIT HARVEST in the MILLENIUM pictured by the Feast of Ingathering. But in the meantime, everybody but the "elect" has been BLINDED (Rom.11:7-8; Isa.29:10-12). "And in this mountain (kingdom -- Dan.2:35,44-45) shall the Eternal of hosts make unto all people a feast of fat things, a feast of wines on the lees (i.e. fermenting), of fat things full of marrow, of wines on the lees well refined" (Isa.25:6). These wines typify JEWISH CHRISTIANS in the MILLENIUM, the fulfillment of the FEAST of INGATHERING. priests swinging willows back and forth as they marched in unison to Jerusalem. This made a swishing sound in the wind. Wind in Hebrew is Ruach or Spirit and coincided with the water being brought back, both symbolizing the HOLY SPIRIT coming for a great harvest.